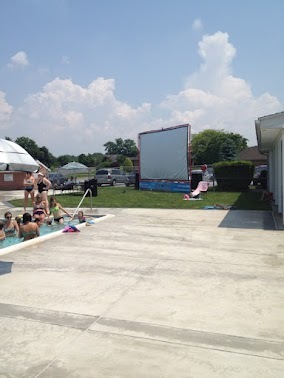 The 2012 Pool season is under way. We hope that you have enjoyed some of the changes made. I am sure most of you noticed the new curtains in the bathrooms, and in the womens bathrooms new toliet seats and sinks. We also have the new No Smoking policy, and finally the SLIDE is fixed! Enjoy! You should notice the upcoming movie night flyers around the pool, plan to attend and support the Moss Spring Stingrays, and have a blast! 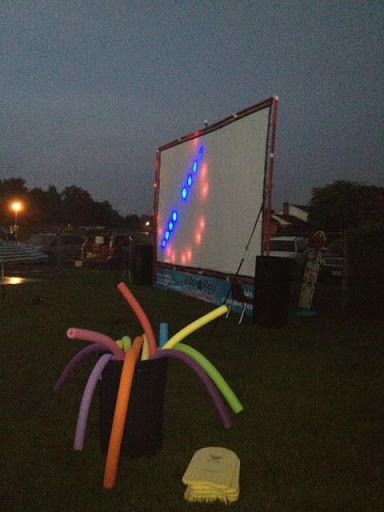 Here is a snapshot of the first movie night being set up… It’s a huge screen, and he has upgraded his speakers, so they sound GREAT! There are Moss Spring Swim Club T-shirts avialable for purchase in the office for just $10.00 We have youth and adult sizes avialable. XXL are $12.00. Be proud of your Club, and sport the shrit!